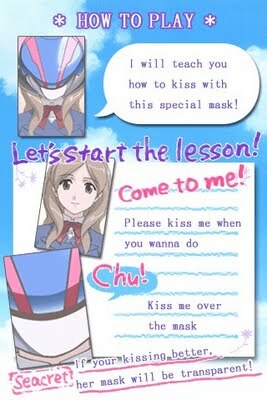 You heard me right, there is an anime kissing game that just came out in the iPhone app store (around Wednesday). From the upcoming Yuri series, Sasameki Koto Yuri, you get to practice your kissing skills and get trained on kissing by Ushio Kazama from the series. Mainly you get scored on how you kiss the image of Kazama. What's cool is that it's FREE, works on the iPhone + iPod Touch and is made for the English market too with English subtitles for the Japanese dialog...with directions in English as well. 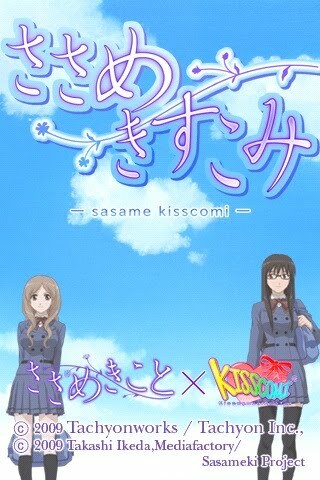 Just search "SasameKisscomi" in the app store and be at a wifi hotspot since this is a large file and won't download in the 3G network (like anything does anyway -_-). Oh and...be sure to sanitize that iPhone before and after using the app. Get practicing people, especially guys; I hear too many girls complaining about bad kissing guys. If you are a yuri fan, check out the series once it comes out in October.